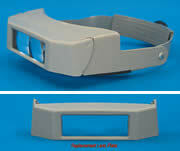 Features a dial adjustment head band that fits any head size. Wellmade magnifiers are lightweight and durable, and fit over eyeglasses. Adjustable pivot assembly on visor can be set to desired tension, so it will stay in place when tilted. Lenses are ground and polished prismatic. Lens plate replacement is also available. Lightweight, adjustable headband for comfort. Tilt up and away when not in use. Close-up magnification while leaving both hands free for working. Single lens with no center post means clear, com-fortable, unobstructed vision with less eye strain and fatigue. Available in a variety of magnifications. 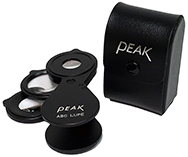 The Peak ABC Lupe is a precision folding lupe, consisting of A lens (12X), B lens (3X) and C lens (6X). With these three lenses combined, seven kinds of magnifying power are available. The lens is made from high quality glass optics and the body is made of aluminum. The magnification desired will be available from the combination table shown on the back of the lupe. Uses high-resolution achromatic lenses whose chromatic aberration has been corrected. 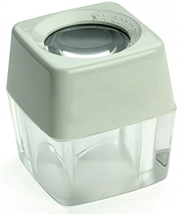 With its wide square Field-of-View (45x45mm) and its interchangeable semi-transparent/ black skirt, this unique magnifier offers you a variety of uses for precision work. Fine focus adjustment with multi-groove screw helicoid system gives you very smooth operation. Neck strap is included. The classic Eyeglass Loupes which set the standard for quality optics many years ago and they are now back with major enhancements. Re-designed to better fit on eyeglasses, these eye loupes are made of precision optical glass, with frames of lightweight and durable acrylic. All lenses are approximately 1" in diameter. 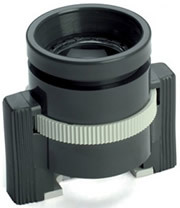 Loupes with double lenses permit the use of either loupe or both together for higher magnification. Loupes swing out of field of view when not needed. They come with customized storage cases. 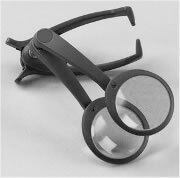 Correction in the Coddington magnifiers is achieved through the use of a single thick lens with a central groove diaphragm. This provides for sharp, crisp image. Illuminated Coddington A problem sometimes encountered in using a high power magnifier is the lack of sufficient light on the object. A bulb inserted in the groove of the Coddington lens illuminates the object being examined eliminating this problem. Requires two 'AA' batteries (not included). A lot of clean in a little package. With Sight Savers® Pre-Moistened Lens Cleaning Tissues, you can conveniently clean lenses and a variety of other surfaces. Place the gravity feed dispenser where it's most accessible in a workplace or office environment. 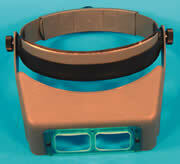 Box measures 5⅜" x 9" x 2⅜"
Clips on to any eyeglass frame leaving hands free. Optical quality plastic lenses enables you to see tiny details without distortion using both eyes. Lightweight, comfortable and adjustable. Comes with carrying pouch. Deluxe quality loupe with individual lenses provides the ultimate in comfortable magnified viewing. 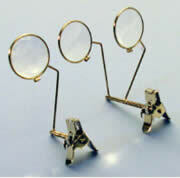 Can be worn over eyeglasses and each lens can be adjusted individually. The headband is adjustable with foam padding for added comfort. Magnification is 21/2 X at a working distance of 14 (365 mm), and the field of view is 2 (51mm). A rugged, clear-coat, aluminum-shelled flashlight that is designed to last for years. Comes with two AAA batteries and storage tube. It is as small as a fountain pen. A standard scale is incorporated in its lens barrel, giving an effecient brightness and excellent definition. It can be focused in the same way as a conventional microscope. A simple device, used for viewing a set of 3-dimensional aerial photos in 3-dimension. 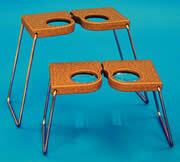 It comes with two support legs that are folded flat for storage and are unfolded for the viewing position. Photos are viewed through the two lenses simultaneously with both eyes. Lenses may be adjusted for suitable eye-to-eye width. The coated lenses are 32mm in diameter and magnifying power is two (2) for #68100 and four (4) for #68101. For the viewing of 4" x 5" (100x125mm) stereo pairs. It stands on 4 folding legs. One of the legs is equipped with a length adjusting device, that provides stabilization to the unit during observation. 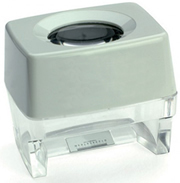 The magnifier can be replaced depending on the application. EMS now offers Anaglyph 3D glasses, Red-Cyan Type and Red-Blue Type. White cardboard frames with temples for your Red-Cyan or Red-Blue 3D anaglyph needs. With red and cyan filters or Red and Blue filters, the glasses can be used for either red left or red right depending on which way you fold the temples. Two different fold-scores allow you to fit the glasses to smaller or larger viewer's heads. A transparent glass plate well polished and marked by the photo-printing technique. It provides very accurate readings and it is a helpful tool for the stereo viewer.